Amy's Creative Pursuits: McMahon Vintage Digitals 'Tennis Anyone?" Hello! Today I have a very simple masculine card to show you. I always keep my male cards 'simple' because I know that's what men prefer. Sorry for the bad photograph. I had to take the picture very early in the morning so the light was 'very blue', and that along with a 'very blue' card, resulted in a bad photo. The image is a new release from McMahon Vintage Digitals 'Tennis Anyone?'. The sketch is by Taylored Expressions. The paper is retired Stampin Up! 'Bella Birds'. The sentiment is from Crafty Secrets. Be sure to check out the McMahon Five Designs Blog to see the rest of this week's new releases. And while your at it, check out my fellow Design Team Members Blogs as well. They are listed in my sidebar. Hi Amy - love the way you have used this image. Hi Amy, your card is so handsome, I love the distress around the image and the ribbon across the front with the buckle, very nice! 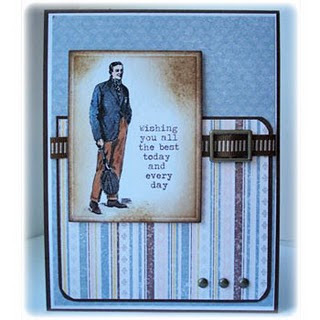 Wow Amy this is one super card what fantastic papers and image loving the distressing and the buckle. Great card- this is my hovering hubby's favorite- (he just fixed the internet at the house we are staying at, so wanted to see what I was doing). Love the buckle embelli and the great DSP you used. Have a safe and happy 4th!